The Department of Kinesiology at the University of Massachusetts Amherst operates the Body Shop Fitness Center in the Totman building. This fitness center serves as a teaching lab and a gym. The Body Shop provides students a chance to have hands on experience with clients and to interact with the Amherst community. Our goal is for the students to apply their knowledge from classes and previous experiences and share it within the Body Shop community. Additionally, the Body Shop is used to conduct a variety of research projects and used for kinesiology courses as well. The Body Shop is open according to the UMass Amherst academic calendar. Please refer to our blog for announcements, or please call 413-577-4700 with any questions. The Body Shop Fitness Center provides research, education, and community outreach to the University of Massachusetts Amherst community through the knowledge of kinesiology students. 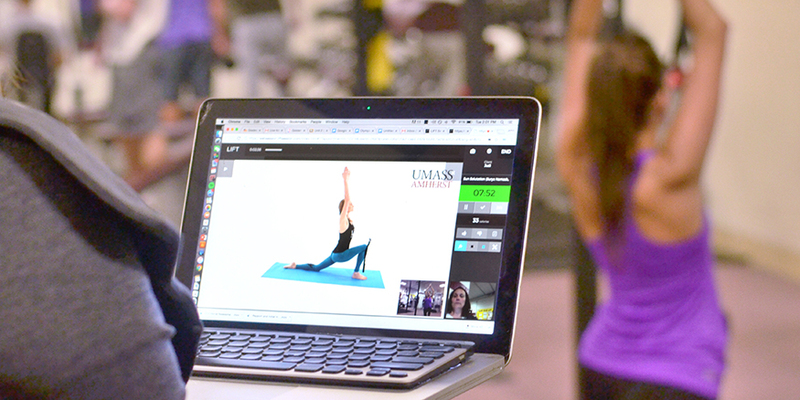 The Department of Kinesiology at the University of Massachusetts Amherst operates an Activity Intervention Center (AIC) through its Body Shop Fitness Center. The AIC provides the facilities, services and expertise necessary to give campus and 5-College investigators the opportunity to conduct physical activity-based intervention studies. The AIC consists of 2,764 square feet of space that includes equipment for strength training and cardiovascular conditioning, including resistance training machines, free-weights, treadmills, elliptical trainers, and stationary cycles. The AIC also offers space for comprehensive fitness assessments and individual consultations. Trained staff are available to work as “trainers” with intervention study participants. One of the strengths of the AIC is our ability to meet the diverse needs of researchers on campus. If you are interested in using the facility for your research project, please contact Judi LaBranche at (413) 577-1520 or by email at jblabran@kin.umass.edu(link sends e-mail).